The brand new issue of Fireworks may just be our best to date. The text size has increased, because we listen to our readers. Don't think you are getting less for your money though, oh no. We still have more interviews than other magazines which cover the genre. We have gorgeous layouts filling half of our 96 glossy, full colour pages. The other half covers a wealth of new releases, DVDs, reissues and live performances. To top it off, there's a fantastic FREE CD with the issue, consisting of 18 tracks! 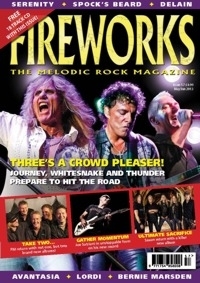 We have interviews with the likes of Journey, Whitesnake, Thunder, Joe Satriani, Bernie Marsden, Saxon, FM, Spock's Beard, Lordi and many, many more. Just in case that isn't enough, we'll given you five FREE bonus interviews below: D-A-D, In This Moment, Huntress, Moritz and Damnation Angels. Enjoy! • Direct from Fireworks HQ by emailing [email protected], paying via Paypal. Send £6 (Inc P&P) for UK, £8.95 (inc P&P) for Europe, and £10.95 (inc P&P) for USA/Rest of World.